The first flavors I pick up is the classic, smoked bacon flavor, along with a light sweetness. The seasonings come in and create the savory sensation with only a hint of spice. The chewing brings on the meaty flavor of smoked pork with the fatty flavor mixed in. 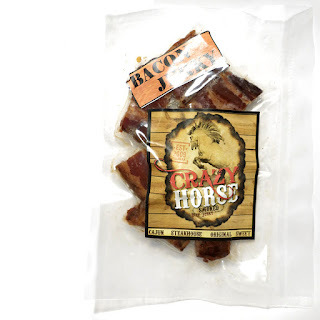 As a bacon jerky, it does pretty well to represent the chewy, meaty expectation of jerky. These are very thick slices, with a lot more meat than standard bacon. You get a lot of meaty chew in each piece. But it's not tough at all, quite moist and tender like a lot of jerky brands these days. Otherwise, this has the full, rich flavor of classic bacon, but of the old school variety, like smoked pork, salted and seasoned, but also sweetned up for snacking. The meat consistency is beautiful. 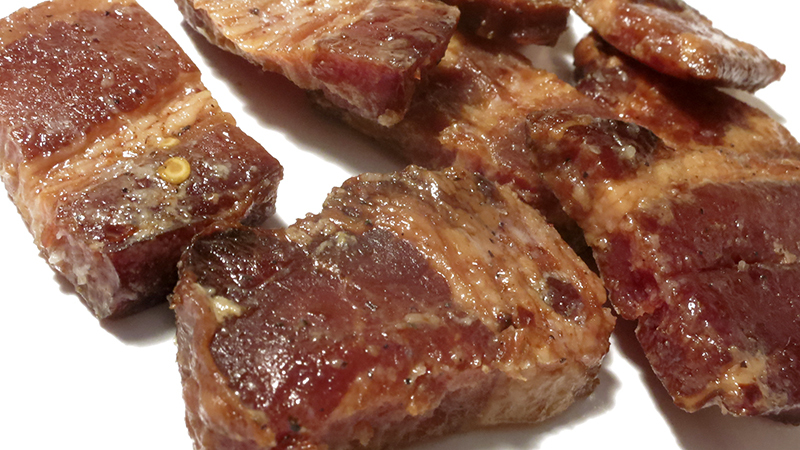 More meat than fat, extra-thick slices, yet tender, moist, and easy to chew. 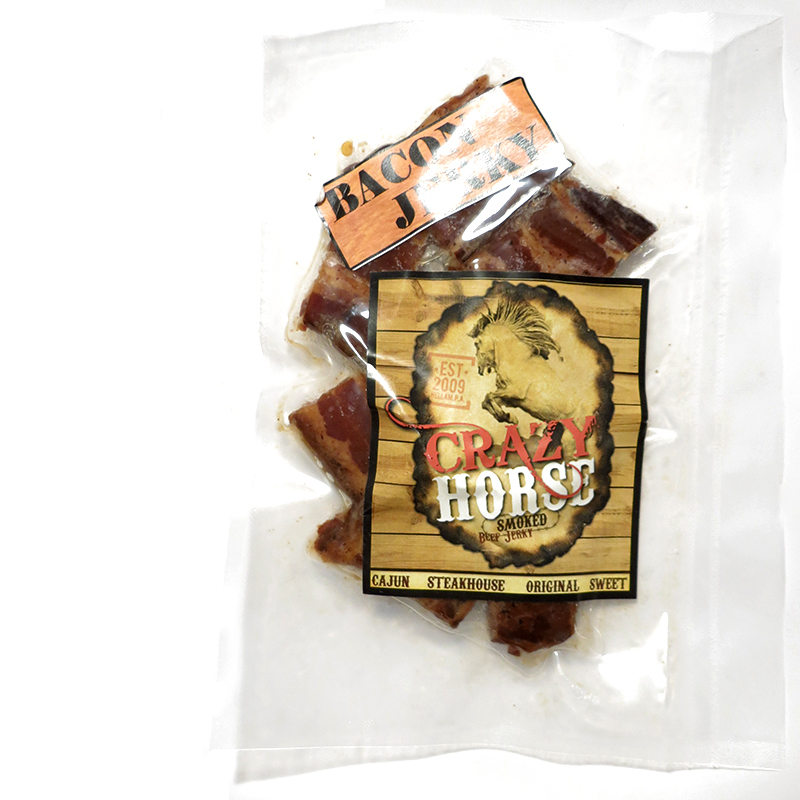 This "Million Dollar Bacon" from Crazy Horse Jerky does a fantastic job of taking the old breakfast classic into a new level of snacking. 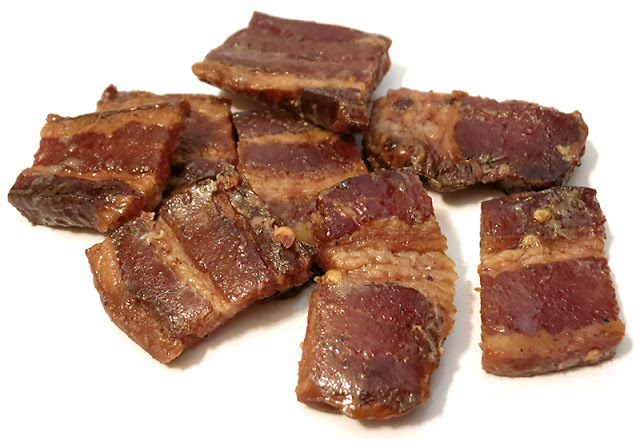 In comparison to other brands of bacon jerky, this gives you extra-thick chunks of meat, not the standard thin-sliced stuff you find in grocery stores. There's actually more meat on this bacon than fat so that you get the full chewing experience of jerky. I also like the bite-sized chunks, and the light sweet, perfect for snacking. This is like dark-chocolate truffles for meat snackers! It would also do well served as appetizers with gourmet cheese and wine.